ADJUSTABLE TENSION SCREW allows you to quickly adapt tension and tightness for quick and noiseless blade opening and cutting. HIGHEST-QUALITY JAPANESE STAINLESS STEEL is exceptionally durable - never dulls and doesn't rust or get stained at all. No more worrying about split ends or coarse and unruly hairs! 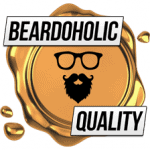 Transform yourself into a master barber with BEARDOHOLIC professional beard scissors for men who want a perfectly trimmed and groomed beard that keeps them confident and handsome wherever they show up. 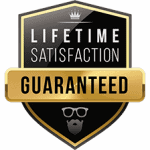 Appropriate for all beard types and sizes, our beard trimming scissors blend and trim your mustache, sideburns and even those hard-to-reach areas quickly and easily with more accuracy than any other similar product. Surgically sharp, premium Japanese steel blades provide a clean and smooth cut every time, removing stray hairs and split ends without sacrificing the length. Get them today and enjoy that impeccable, mess-free beard for many years to come!